Born in Japan in 1973, Mie Ogura started to play the piano when she was very young-only 3 years of age, and also flute at the age of 7. 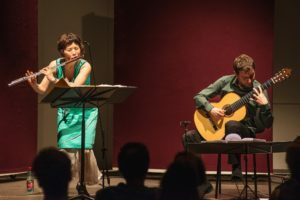 In 1994, Mie Ogura moved to France and graduated with a Diplôme from Conservatoire National Supérieur de Musique de Paris under Pierre-Yves Artaud and Sophie Cherrier, and the Academia Musicale de Chigiana (Italy) under Aurèle Nicolet (flute) and Alain Meunier(chamber music). After she obtained a contemporary improvisation prize, she also became inserested in many other languages of improvisation, so she continued to study the baroque flute with Pierre Séchet and jazz improvisation with Glenn Ferris, Jean-Charles Richard, as well as Indian music with Patrick Moutal. Mie Ogura is one of the few flutists in the world who can play different styles such as classical and contemporary music, jazz and traditional music. She has appeared regulary as soloist and chamber musician with many different ensembles and orchestras, invited at many festivals in Europe, the United States, Canada, Japan, Australia. She has recorded seven CDs. At present, she makes a world concert tour in a Duo with Atanas Ourkouzounov (guitar) and a Duo with Marie-Catherine Girod (piano). She is passionate about teaching and she has edited the jazz flute book for beginners « Flute Jazz Coffeebreak », published in 2005 at Edition Trim (Japan). She is currently Flute and Improvisation professor at the “Jacques Ibert” Conservatory of Paris.